Glucose units - how does our blood sugar converter work? 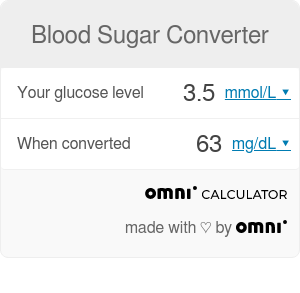 This blood sugar converter helps you easily interpret your glucose levels in venous blood by switching between the international standard mmol/L and the popular mg/dL glucose units. If you're confused what is considered as normal blood sugar level or what's the glycemia definition, read on! If you feel that your blood sugar level grew a lot after eating too many donuts, don't worry - check how to burn those calories with our donut calculator. It can be useful to see how many calories a day you need. Glycemia means precisely the presence of glucose in one's blood, but the term is also used for the concentration of glucose in the blood. The analysis is most accurate in venous blood serum, as glucose in capillary blood used by popular glucose meters tends to grow significantly higher after meals. Hypoglycemia - in healthy people glycemia below 2.8 mmol/L (50 mg/dL), in people with diabetes levels below 3.9 mmol/L (70 mg/dL). Normoglycemia - the so-called 'normal blood sugar' is between 2.8 mmol/L and 5.5 mmol/L (50 to 100 mg/dL) and 3.9 and 5.5 mmol/L (70 to 100 mg/dL) for diabetics. Hyperglycemia - sugar levels higher than 11.1 mmol/l (200 mg/dl) are considered to be hyperglycemic. There are two manners of presenting the concentration of glucose in the blood. The international standard way of measuring blood glucose levels is in terms of a molar concentration, measured in mmol/L (millimoles per litre; or millimolar, mM for short). In the United States, and continental Europe mass concentration is predominantly measured in mg/dL (milligrams per decilitre). but calculating it in your own head can be a bit overwhelming. Our blood sugar converter solves this problem for you. In healthy people, the body's homeostatic mechanism of blood sugar regulation restores the blood sugar level to a range of about 4.4 to 6.1 mmol/L (79 to 110 mg/dL). The blood glucose level may rise temporarily after meals, in non-diabetics up to 7.8 mmol/L (140 mg/dL). According to the American Diabetes Association, the blood glucose target range for diabetics should be 5.0 to 7.2 mmol/l (90 to 130 mg/dL) before meals, and less than 10 mmol/L (180 mg/dL) after meals. If you are having high glucose levels do not hesitate to check also cholesterol ratio calculator! With our other useful calculators, you can estimate how many calories your body burns at rest or when you're walking. Blood Sugar Converter can be embedded on your website to enrich the content you wrote and make it easier for your visitors to understand your message.